A variety of photos that translate well for any office or home wall. This flower is unique and creates a great piece of art. A contrast with the blue of the Lupine flowers and the green background. Blue Lupines filled this area with soft color and fragrance. This brilliant Echinacea is a feast for the honey gatherer. This Hawaiian Plumeria is contrasted against the sky. The gardens at The Glades offers a great macro image. The Orton Effect has been applied to these two daisy's. Two Sandhill Cranes soaring above the bird sanctuary. This Sandhill Crane was very cooperative. A wispy cloud hangs above the land. 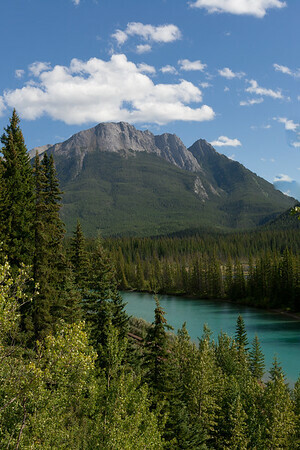 The blue of the sky is challenged by the blue of the water in this Alberta scene. Water flowing over the rocks creates white water as well as clear. The backward motion of the stream creates white water. 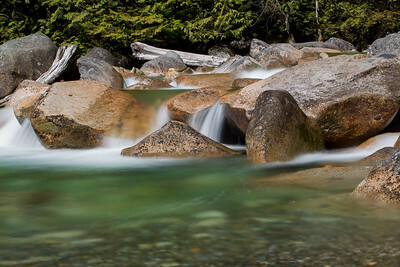 The long exposure here shows the flow of the stream around the rocks. 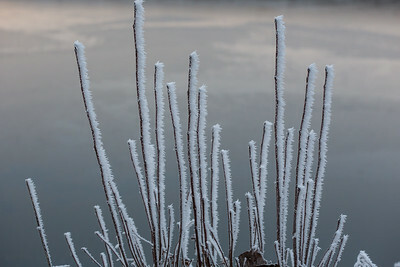 This scene is during a cold fog which has frozen to the branches and grasses. The Hoar Frost provides great contrast with the Red berries. The Hoar Frost on these branches clearly shows which direction the wind is moving. The rocks provide a pathway for the waterfall.